USB TV Box Cute TV. An external device which allows users to watch tv or view video signals through a VGA monitor. The user can also capture video and still frames. USB TV Box U-Shuttle. A video to VGA devices which not allows users to view video & tv, listen to FM radio and video capture up to 30fps in 704 x 480 resolution. The Travel TV High Speed TV Box is a USB Bus powered TV receiver. It allows high quality TV/Video to be viewed on PC's and notebooks and also has FM radio receiving capabilites. The Composite Video/S - Video to PC Converter Box is a simple, yet good quality converter. It can convert a Composite Video or S-Video signal (NTSC or PAL system) to PC (XGA, SXGA and UXGA) resolutions. Ideal for utilizing your PC monitor to display standard video images from DVD or VCR players, set top boxes, video game consoles, camcorders and security system cameras. The Video to PC/HD Converter is designed to upscale standard definition composite and S-video, PAL or NTSC signals to PC (XGA, SXGA and UXGA) or High Definition (480p to 1080p) progressive scan resolutions. 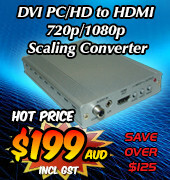 Frame rate conversions from 50Hz to 60Hz allows users to view any video sources on a PC monitor or TV. Ideal for utilizing your PC monitor to display standard video images from DVD or VCR players, set top boxes, video game consoles, camcorders and security system cameras, etc. The Video Edit Kit - TV - DV - AV All-in-One plus Combo bay transforms your ordinary PC into a powerful video editing studio and home entertainment center. The All Video to HDMI Converter accepts most video formats, outputting as an HDMI video/audio stream for viewing content in High Definition resolution on HDTV's. It also allows you to have your DVD player, game console, Set-top box, PC and other devices connected and ready for selection to instantly display to your HDTV. This 2.4GHz wireless CMOS camera & receiver with USB Video Capture is a wireless audio and video transmitter and receiver with 1/3" colour CMOS video camera and microphone integrated into the transmitter. The video capture function can capture both still and full motion video and it can capture the image instantly. The Internet Camera IP 3 in 1 for PC has a built-in high-speed image and network processor and functions as a powerful internet camera device with many internet services. The internet camera has as standard inclusion a high-quality CMOS sensor with 6 infrared LED lights that provide clear images in the dark. This high resolution image processor is an IP camera, PC camera, Wi-Fi camera and DIVX MPEG4 capture box all 4 in 1 unit. It has a built-in high-speed image and network processor and functions with many internet services. The PC and Video System Overlay Processor is designed to overlay PC text or graphics onto a Composite or S-Video screen image. You can overlay CV or SV graphics onto a PC screen image. and enhance your screen presentations with the ability to mix images from various sources onto the one screen. The device can be used with any screen or monitor that supports PC VGA or CV/SV video input. Video to 1080p High Definition Converter/Scaler for managing Analog or Digital Composite, S-video, PC, Component (High Definition) and HDMI input source to an HDMI Digital output source of wide-range HDTV up to 1080p and PC resolutions up to WUXGA (1920 x 1200 pixels). Top End Video to 1080p High Definition Converter/Scaler is ideal for combining all of your Video, DVD, X-Box players, Multimedia Units, Set-top Box and much more into one High Definition PC or TV output. The Video-Scart-HDMI to HDMI Scaler Selector is designed to scale up Scart, Composite Video and S-Video inputs to HDMI output in a variety of HDTV resolutions. 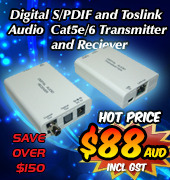 It also accepts two HDMI inputs that can be selected for pass thru to the HDMI output. High Definition Digital WiFi Media Player 1080P-1 allows digital movies, music, pictures and files stored on a CF memory card to be displayed at High Definition Resolutions of up to 720p/1080i/1080p. The standalone device also features wireless network capabilities. 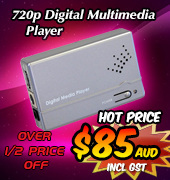 High Definition Digital Media Player 1080P-1 allows movies, music, digital pictures and files stored on a CF memory card to be displayed to any TV/Monitor device without the use of a Computer. The unit can also connect directly to the Internet via a PC for file sharing and transfer.